Antonius Hockelmann (German, b. 1937) Female Figure in an Abstracted Landscape. Female Figure in an Abstracted Landscape. 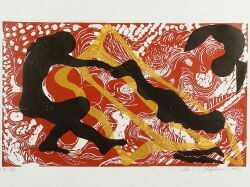 Signed and dated (in pencil) "Antonius Hockelmann 1982" l.r., numbered "IV/VIII" l.l. 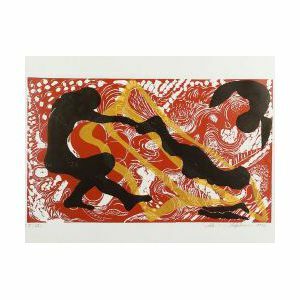 Linoleum cut print, 31 1/4 x 39 1/4 in., unframed. Condition: Minor handling creases/damage to edges.